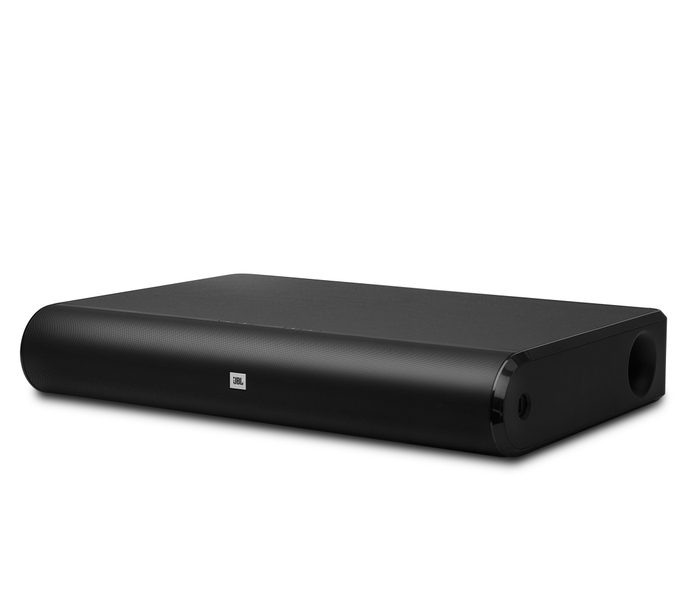 Berlin, Germany – JBL today unveils two new additions to its superb home audio collection at IFA 2014, the JBL Cinema SB 350 $399.95 and the JBL Cinema Base $349.95. Designed to complement your flat-screen TV, JBL Cinema Base projects stunning big-movie sound with Dolby Digital and Harman Display Surround sound from a sleek, self-contained package. Its all-in-one tabletop form is designed to fit neatly under most TVs up to 60". JBL Cinema Base connects with a single cable to your TV using an HDMI, optical or analog connection, and streams music from smartphones or tablets wirelessly using Bluetooth. 240 watts of power drive the built-in 65 mm left- and right-channel speakers and integrated, independently adjustable dual 90 mm subwoofers. To enhance viewing and listening pleasure, JBL Cinema Base features Harman Volume, which keeps sudden volume changes from disrupting the experience — no more suddenly loud commercials and can learn any TV remote volume control, giving you simplified control over your cinema experience. While you're watching, JBL Cinema Base's side USB port charges other devices, including your phone or tablet. To add visual appeal and fit into any room decor, the unique metallic speaker grille is both elegant and easy to clean. The JBL Cinema SB350 produces high-quality movie sound with Dolby Digital and Harman Display Surround sound from a great-looking compact unit that perfectly matches wall mounted or table stand installations. 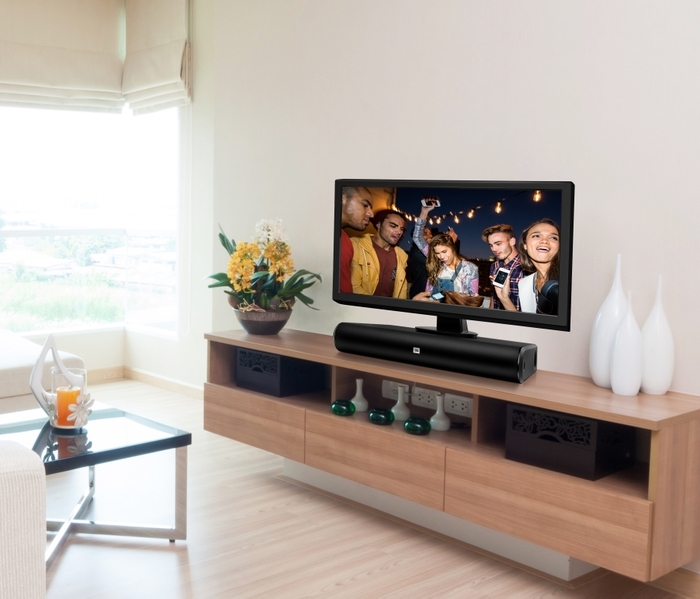 The separate subwoofer wirelessly connects to the Soundbar, allowing freedom of placement in any room, and with independent volume control, can be adjusted for the perfect level of bass at any time from your remote. All this great sound and functionality connects with a single cable to your TV using a HDMI, optical or analog connection, and streams music from smartphones or tablets wirelessly using Bluetooth. 160 watts of power drive the Soundbar's built-in left and right channel speakers with another 160 watts for the wireless subwoofer. 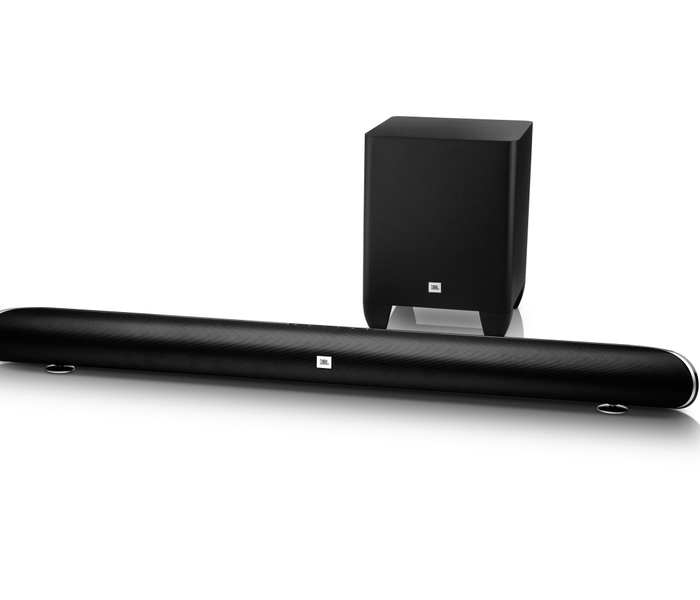 JBL Cinema SB350 also features Harman Volume, designed to keep volume changes from disrupting the viewing experience. The system can learn any TV remote volume control, giving you full control over your cinema experience, using your own remote. Hardware to let you mount the soundbar on your wall is included, and all cables to connect to your television. “The Cinema SB350 delivers that total quality 2.1 system sound in a compact soundbar plus wireless powered subwoofer system that adapts to your own TV remote and fits your flatscreen. Room-filling, believable sound is an essential part of the home theater viewing experience,” said Michael Mauser, President, Lifestyle Division, HARMAN. HARMAN (www.harman.com) designs, manufactures and markets premier audio, visual, infotainment and integrated control solutions for the automotive, consumer and professional markets. With leading brands including AKG®, Harman Kardon®, Infinity®, JBL®, Lexicon® and Mark Levinson ®, the Company is admired by audiophiles, musicians and the entertainment venues where they perform. More than 25 million automobiles on the road today are equipped with HARMAN audio and infotainment systems. HARMAN has a workforce of approximately 16,000 people across the Americas, Europe, and Asia and reported sales of $5.3 billion for the twelve months ended June 30, 2014.